so... 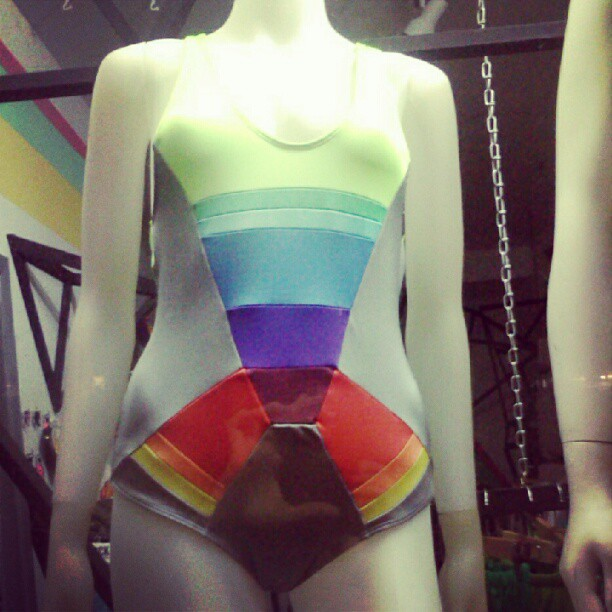 I've done more research.... and by googling "Williamsburgh color block swimsuit".... I nailed it. The designers are named. R. Mackswell Sherman and Sarah Jones, and they have a company called Ruffeo Hearts Lil Snotty... or RHLS. ...After looking through their last 2 seasons of garments, my first thought is that someone really loves sewing curved seams.... (since all the clothes have really complicated seaming).... but there is more to it than that.. There is humor, and interesting wearable shapes... It looks like there is some reference to Walter Van Beirendonck. ...And the clothes are made in NY.... So go pick up your crazy high waisted mouth mini-skirt today!! !